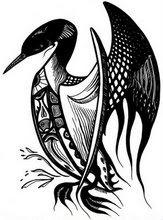 loon pond: In which the pond modestly proposes a new passport and a travel allowance be provided to Peter Costello, and he's urged to become more cosmopolitan .. In which the pond modestly proposes a new passport and a travel allowance be provided to Peter Costello, and he's urged to become more cosmopolitan ..
(Above: editor's choice? They scraped the bottom of the barrel, and this was the best they could come up with? Editor's choice? Gina Rinehart will be pleased). There was a fierce fight at the pond yesterday. Was it more appropriate to describe media regulation in Australia as pathetic ... or tragic? In the end, a compromise was reached ... it was routinely scandalous. David Salter addresses the ACMA scandal in ACMA squibs again: how Nine got away with pokie propaganda, whereby two broadcast commentators got away with a paid political broadcast because it was scripted and paid for by Nine (yes as part of their duties Ray Warren and Phil Gould read their lines like first class parrots, and Warren himself a prime example of the impact gambling can have on a life, and it didn't matter that much because it was an in-house rort). Then you only had to flick across to see how the Australian Press Council was doing by reading Paul Barry's piece Tele buries the lead on Press Council slaps (may be paywalled). The rampantly out of control tabloid Terror was ruled to have been in serious, gravely inaccurate, unfair and offensive, yadda yadda, when it came to a brazen front page about the invasion of boat people, and the rag promptly buried the ruling inside its bowels, after its editor assuring the world (via Barry) that it would give prominence to Press Council rulings. Of course if you take a stand against tabloidism, you're immediately dismissed as one of the sneering inner city coffee quaffing elites, and last night watching a repeat of a show about Uncle Joe Stalin on Al Jazeera - sorry, it was actually SBS2, it's so hard to separate out their news services these days - the pond was reminded that in Stalin's day, cosmopolitanism was a capital crime. Now there are technical and philosophical definitions of cosmopolitanism ranging back to the days of the ancient Greek and Romans (you can get a dose of that at Stanford's encyclopedia of philosophy here), but rootless cosmopolitan was Stalin's way of attacking Jews and elites. "unbridled, evil-minded cosmopolitans, profiteers with no roots and no conscience… Grown on rotten yeast of bourgeois cosmopolitanism, decadence and formalism… non-indigenous nationals without a motherland, who poison with stench… our proletarian culture. "… "What can A. Gurvich possibly understand about the national character of a Russian Soviet man? The common latter day notion of "cosmopolitan" derives from the dictionary definition of being sophisticated, at home in all parts of the world or conversant with many spheres of interest. An arty wanker if you will ... (not that there's anything wrong with the arts or wanking). The global citizen is often ashamed to be Australian. Many of those who prefer to be a global citizen rather than an Australian citizen come from the same inner-city cultural elites that house the core of left-wing progressive politics. First-generation Australians such as those employed at SBS, public intellectuals such as Robert Manne and Raimond Gaita, academics of almost any discipline, teachers, actors, movie-makers, the arts industry, novelists, poets, playwrights, many journalists—all seem to be much more concerned with their responsibilities as global citizens than as Australians. Our arts, plays, poems, novels echo the demands of global fashion rather than any concern with the Satya (search for truth) of which Gandhi spoke. The cads, the fiends, the cosmopolitans. Send 'em to the gulag. Truly Stalin's henchmen in the late nineteen forties couldn't have put it better. So the next time you read someone in a News Ltd or right wing publication railing at inner city elites, remember that Uncle Joe will be smiling up from the earth at his comradely fellows who fear the evil cosmopolitan. The left-wing liberal from inner Sydney lectures him on global warming, the smarmy ABC host paints him as a fool and the tattooed feminist blithely patronises his hard-working wife as downtrodden. Perhaps there's a solution. What this country needs is a good firm hand to root out undermining lackadaisical cosmopolitans. An Uncle Joe Stalin in disguise. Come on down Andrew Bolt ... the media is yours, next step politics, and the rooting out of cosmopolitans. Oh alright, you guessed it. If you've reached this point, you'll have realised that the pond has once again shirked its duty. 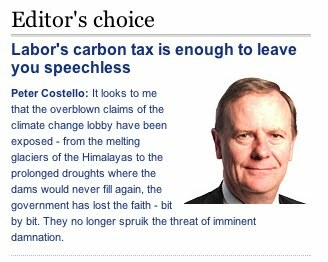 Sometimes on a wind-blown soggy chilly day, it's so hard to get up in the morning and read The Australian, or The Terror or the Hun, or the thoughts of "editor's choice" Peter Costello, scribbling Labor's carbon tax is enough to leave you speechless. The trouble of course is that the carbon tax hasn't left Costello speechless. If it had, what joy to the world. For the most part, it's a routine bit of Labor bashing, written by rote by a man who's done it so often, he must sometimes wake his wife up in the night as he splutters and moans "No he's not the world's greatest treasurer, I'm the world's greatest treasurer. I am, I am too, and I have a most charming smirk." We were told we had to do this because, if we didn't, the planet would heat up, the seas would rise, the polar caps would melt and the polar bear would be threatened with extinction. This from a man who was a key part of a government that took to the electorate an Emissions Trading Scheme, announced in a speech in July 17 2007, which nostalgia hunters can find here. It looks to me that the overblown claims of the climate change lobby have been exposed - from the melting glaciers of the Himalayas to the prolonged droughts where the dams would never fill again, the government has lost the faith - bit by bit. They no longer spruik the threat of imminent damnation. Yet they still recommend the same way to salvation. Uh huh, it's the world's greatest treasurer showing he's the world's greatest climate scientist. Naysayers notwithstanding, new studies show that Himalayan glaciers are indeed melting possibly due to climate change. The rate of their melting is not as alarming as projected by the Intergovernmental Panel on Climate Change (IPCC) in 2007 but is significant enough to seriously impact water availability in Asia in future. The warning comes from a new study which has found that glaciers in the Himalayas and Karakoram occupy an area of 40,800 square kilometers. The new estimate is almost 20 percent lower compared to earlier projections. Based on data relating to length, area, volume changes and mass budgets, the study shows that 0.4 per cent of glacier area is getting depleted every year. (and so on here). As for droughts, they come and go, but it's a measure of Costello's insular view of the world that he thinks climate science is all about the dams of Australia. The point of course is that talking of droughts or rain - or just looking out the window and seeing what's happening with the weather, which is Miranda the Devine's idea of a scientific approach - is irrelevant when it comes to observing trends. And what trend might that be? Climate change is a large, complex and serious global challenge that will occupy the world for decades to come. Over time, the scientific evidence that the climate is warming has become quite compelling and the link between emissions of greenhouse gases from human activity and higher temperatures is also convincing. A visionary. And did Australia dodge a bullet when the smirk dodged the Lodge or what? (Below: quick, give Peter Costello this passport and a travel allowance, so he can get out and about a bit. Perhaps he could do a tour of the world studying glaciers and droughts. He seems to know diddly squat about them, or the plight of polar bears). Well OK then, if it makes them feel better, I'm proud to be an Australian. I'm proud of our dumbed-down tabloid conservative media, our national disdain for thought, our love of slogans and "footy". I listen to Ray Hadley every day, I'm frightened of foreigners, and I know global warming is crap because Ray and Tony Abbott tell me so. The ABC is a bunch of leftist pinkos, but they must be pretending because I agree with most of they say on their news and current affairs. Standard Stalinist conspiracy theories were accompanied by a crusade in the state-controlled mass media to expose pseudonyms. Blogs and a large number of comment sites specialise in political extremism and personal vilification. Radical sweeping statements unsubstantiated with evidence are common. It was also about the often white noise between social media and traditional media. And how a bunch of anonymous bullies took to websites to vent their prejudice and inexplicably made the jump to mainstream news outlets. Remember when to express your opinion you had to write a letter to the editor? The paper would only run the best letters with a view to balance and content. Now there’s no such filter and the online tyrants are running amok. There will be no midnight knock on the door, pondy, because I hereby do renounce all politically-incorrect thoughts. I hate leftism and love Uncle Rupert. Stop the Boats. God Save the Queen. Stop the Tax and, um, Stop the Debt. Now, if you'll excuse me, I have to go and watch the IPA on ABCNews24 so as to get the Right Thinking talking points for the day.